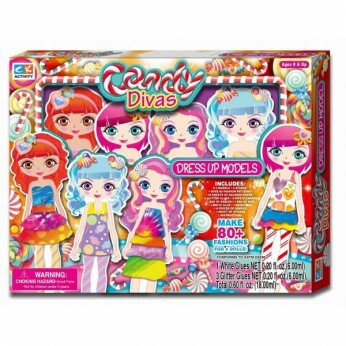 Candy Divas Dress Up Model-Make 80+ Fashions For 4 Dolls. This set includes 4 models,4 stands, over 80 fashion patterns, 10sheet of colored paper,3glitter glue, 4pipe cleaners,1 bag of sequins,1 bag of gems, 1 white glue, 1 magic tape, 10 pieces offabric, 1 sheet of stickers, instruction sheet…. This toy costs approximately £9.99 (for the latest and best prices make sure you check our retailer list for the Candy Divas Dress Up Model above). In our review of Candy Divas Dress Up Model we classed it as being suitable for ages 6 years, 7 years, 8 years but recommend you check the manufacturer specific advice before purchasing.